The Golf Trust today announces a new partnership with The Els for Autism Foundation, including a programme of activity to offer UK individuals on the autism spectrum the opportunity to use golf as a life skills and physical development tool. 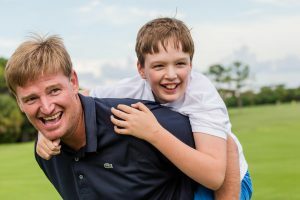 Established in 2009 by PGA TOUR golfer Ernie Els and his wife Liezl (residents of Jupiter, FL) shortly after their son Ben was diagnosed with autism. The charity will deliver Els for Autism’s structured 12-session #GameON Autism™ Golf programme, with the first initiatives taking place at five North London venues. These include The Village School in Kingsbury and Mapledown School in Brent Cross, working with The Shire London in Barnet, and the Belvue School working with the West London Golf Centre, both in Northolt. A #GameON pilot 12-session programme involving eight individuals on the autism spectrum has been running at T he Village School and The Shire London since November 2016, led by The Golf Trust’s Cae Menai-Davis and Chris Whitelegg. This first programme will end in February 2017, after a final progress assessment, and it is the first #GameON programme to take place in the UK, after USA pilots involving 100 children in seven cities ran in 2015-16. The global #GameON rollout is scheduled to start in 2017. The second UK #GameON pilot 12-session programme started at the West London Golf Centre on January 13th, 2017, led by The Golf Trust’s Nigel Lawrence and Tom Talbot, again involving eight individuals, this time from the nearby Belvue School. The third will start at The Shire London on January 31st, 2017, in conjunction with Mapledown School. 37 Golf Trust coaches based in the South East of England have already been trained to deliver #GameON Autism Golf programme, and plans are in place to offer similar training to the majority of The Golf Trust’s 221 golf coaches in the UK and in the Caribbean, over the next two years. For PGA Professionals, CPD points are available for those who go through autism training. “It is a huge step for us to partner with an organisation with the stature of The Els For Autism Foundation” said The Golf Trust co-founder, Cae Menai-Davis. “Their work is recognised around the world, and we are delighted to have been chosen to run their first #GameON Autism Golf programme outside the USA. “We are thrilled to be partnering with The Golf Trust to bring golf to people with autism of all levels of ability in the UK using evidence-based teaching strategies”, says Dr. Marlene Sotelo, Director of Programs and Operations for the Els for Autism Foundation USA. “With a maximum size of just eight people, over the 12-session programme the #GameON coaches and their pupils form a very close and rewarding personal bond which is tremendously beneficial both to player and coach” said Menai-Davis. “With almost 200 The Golf Trust coaches across the UK still to receive their #GameON training, we have plenty of work to do before we can claim that the benefits of golf for autistic people are being properly explained and coached across the country” he said.